There are several interesting sites along Wildrose Road, on the west side of Death Valley National Park, which are visited much less often than the busy locations along the valley floor, and are not quite so hot in summer due to the relatively high elevations. One is Aguereberry Point, a 6,300 foot peak, similar to Dantes View on the far side, 20 miles away in a direct line but 77 miles by road. Because of its westerly setting, this place is one of the best locations to photograph the valley in afternoon and around sunset. 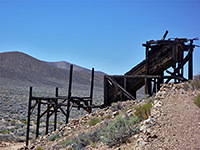 The point is reached by a 6.5 mile unpaved track that ends right by the summit, and on the way passes the remains of Harrisburg, a small and long abandoned mining settlement similar to Skidoo a few miles north. 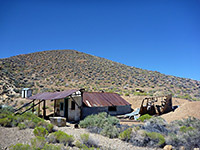 Here are found a wooden mill, several shafts and adits, assorted iron machinery and some ruined buildings (Aguereberry Camp), last inhabited in the mid 1940s. The road itself is quite scenic, crossing open flats then winding through a narrow canyon, and is generally fine for all vehicles except when snow covered in midwinter. Map of Death Valley National Park. 14 views of Aguereberry Point and Harrisburg. The side track forks off Wildrose Road in the middle of the Harrisburg Flats, 12 miles from CA 190, and soon runs alongside a cluster of small hills, first passing the ruins of Aguereberry Camp, located at the mouth of a ravine, 400 feet south of the road. The camp includes a two-storey residential building, still containing such domestic items as a stove, fridge, tables, cupboards and bed, plus various smaller structures. 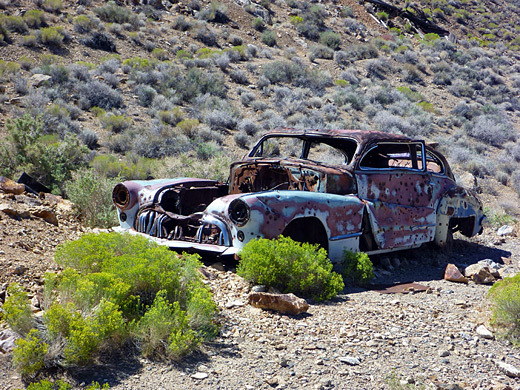 A trail continues east, past a photogenic old car to the Eureka Mine district, on the east side of the hill; a location also reached by a spur off the main road. 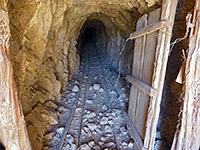 A set of rusty narrow gauge rails lead to the entrance of one of the tunnels, and there are other shafts nearby, some containing old equipment. The tunnels are closed by gates in winter and spring to protect hibernating bats but are open at other times. Cashier Mill is nearby - quite well preserved, like the larger example at Skidoo. Other tracks head south across barren plains to more distant sites including Napoleon Mine. Harrisburg was founded by Pete Aguereberry and Shorty Harris in 1906, but few permanent structures were built before most inhabitants moved to Skidoo, which had better prospects. After Harrisburg, the road passes through a gap in a larger range of hills, into the grassy upper end of a valley, and turns south, up a narrow, winding ravine which ends beneath a ridge branching off the Aguereberry Point summit. Close up views include a steep-sided ravine to the south (a tributary of Trail Canyon), which is bordered by jagged, inclined strata, and colorful slopes and mounds to the north, around Blackwater Wash. A ridge to the east obscures some of the nearest section of Death Valley but much is in view, especially northwards; the panorama extends over 30 miles, from Salt Creek to Badwater and beyond. A trail follows the fractured, rocky ridgeline for 300 feet, while a lesser path descends a little and climbs towards the westernmost summit for even better views. Another short trail leaves the road a third of a mile before the end, ascending slightly to a secondary peak, overlooking an adjacent tributary of Trail Canyon.